Texas Baptist Men disaster relief crews are responding to two hurricanes in the Southeast, and officials with the missions organization are asking additional trained volunteers to step forward to serve. TBM continues to serve in the Bayboro, N.C., area to assist survivors of Hurricane Florence. Through Oct. 16, TBM workers contributed more than 11,000 volunteer hours in the area, making more than 1,400 personal contacts and cooking more than 3,100 meals. 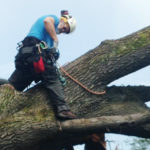 They also are using chainsaws to remove fallen trees, tearing out damaged drywall and flooring from flooded homes and tacking blue tarps on roofs. They have provided access to more than 1,000 showers, washed about 500 loads of laundry and distributed 150 Bibles. Hurricane Michael made landfall in the Florida Panhandle Oct. 10 as a Category 4 storm. In response, TBM deployed chainsaw teams, heavy equipment operators, an incident management team and volunteers to run shower and laundry units, along with an emergency food-service crew and field kitchen. TBM crews stationed at Blue Springs Baptist Conference Center in Marianna, Fla., already have contributed nearly 1,000 volunteer hours. Another team was scheduled to begin serving meals from First Baptist Church in Quincy, Fla., Oct. 17. Closer to home, TBM deployed two shower and laundry units to Marble Falls, where 13 inches of rain caused catastrophic flooding. The Llano River set a record at 30 feet above flood level, and floodwaters swept away a bridge. Residents in parts of Burnett and Llano counties were evacuated from their homes. When a shelter at Marble Falls Middle School reached capacity, a second shelter was established at First Baptist Church. The ongoing disaster relief operations overlap with a recently completed mission to Sonora, where TBM workers contributed more than 5,300 volunteer hours to help the community recover from floods. “We have plenty of opportunities to serve and share the gospel after disasters. Only one thing is holding us back—volunteer numbers,” Terry Henderson, TBM state director of disaster relief wrote in an Oct. 16 email. Anyone who serves with TBM must have a current disaster relief badge, which signifies the person has passed a background check and completed basic “yellow cap” orientation, he noted. Trained volunteers should contact an area coordinator or specialty ministry coordinator, or they can email volunteerdr@tbmtx.org. To contribute financially, send a check designated “disaster relief” to Texas Baptist Men, 5351 Catron, Dallas, TX 75227, call (214) 275-1116 or click here.